I recently returned from a 3-night backpacking trip in the Desolation Wilderness. This adventure offered a cornucopia of surprises including 50-mph wind gusts, heavy rain and snow and campground thieves. It was a heck on adventure! Three of the four days featured stormy, windy, and overcast conditions while a layover day was mostly sunny and breezy. Temperatures never exceeded 65 degrees. The howling winds smashing the side of my tent often affected my sleep. The last night was notably piercing and the open basin sounded like a wind tunnel. Fortunately the smothering rain changed to snow after sunset and the frozen sides of my tent helped weigh it down. If it hadn’t snowed my tent would have surely flooded. The next morning was gorgeous until 9:45 am when the weather soured. By 11:15 am I experienced blizzard-like conditions ascending 8500-foot Maggie’s Peak en route to the Bayview Trailhead. Overall, the wilderness was gorgeous with shimmering water and shining slabs of granite. Most peaks here top out just south of 10,000 feet so there isn’t as much vertical relief for photography. We saw only 5 people over the last 3 days and I was elated with the level of solitude! Obviously, the weather had something to do with that. I’ll have a few more pictures on my website soon. Enclosed are a couple of cell phone shots. If you want to learn more about this trip, hit me up and I’ll pen a follow-up! A view near base camp. Autumn, the time when the weather cools, school starts, football returns, the leaves change and fall, and everyone’s lives get a little busier. This is notably true for landscape photographers as the fall is a consensus “favorite” season for many shutterbugs. Late September is an unpredictable time as the last days of summer usher in a wide variety of atmospheric conditions. Humidity decreases, so does the bugs and crowds, creating innumerable possibilities for those fortunate enough to travel. I was hoping to revisit my favorite waterfall while in Yellowstone. This shot was captured in September 2009. I find myself currently in this position with my girlfriend who works for a major airline, the opportunities are endless to explore new places. The plan was to return to Yellowstone, as September is known as the “golden month” in the world’s first national park. However, the upcoming weather forecast is calling for below normal temps and extended periods of precipitation (rain/snow mix), which makes backpacking less fun. Long story short we decided to look elsewhere. Some of the places we considered were Acadia National Park and Baxter State Park (ME), Blackwater Falls SP (WV), Cathedral Gorge State Park (NV), Lassen Volcanic NP and Channel Islands NP (CA), and now the search continues. We still haven’t decided on a destination although it is now looking like California again. What places do you recommend during this time of year? In other news, I am back in editing mode working on my new releases gallery. Most of the images will be from summer backpacking trips around the San Juans as I am diligently working toward a printed version of my book. However, you’ll also discover images from other states too. It is a work in progress but check back regularly for frequent updates and happy leaf peeping! I’m back from a three-week adventure to Colorado specifically for additions and updates to my book. The trip was a tremendous success for photography. It rained more this summer than my previous visits, which made for interesting conditions. I witnessed better sunrises, unique cloud formations and prolific waterfalls. However, my feet were constantly wet and I spent more time holed up in my tent, which also incurred some damage. 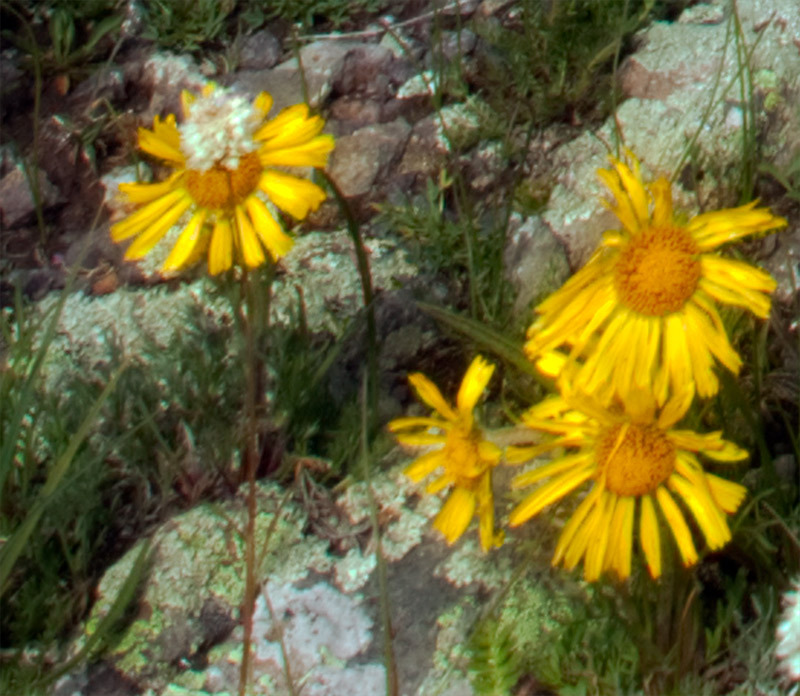 Overall, it was a good year for wildflowers with some spots showing better than before while others not as prolific. I also was fortunate to visit some new places and meet some new friends. Currently, I am working on processing images as well as a new book design. My plan is to have the book in print by next spring. It will surely be the best version yet with even more spectacular pictures and places to visit! Stay tuned for more exciting news, updates, and I’ll explore other related topics too! Arizona is brimming with enchanting places to explore including over a dozen national monuments. This is the second of a three part series on my favorites, including the pros and cons, best times to visit, and other key travel tips. A long, winding dirt road pierces the desert floor leading toward a crest of crimson cliffs. While speckles of jubilant yellow dot the hillsides, this is a foreboding place. Chiseled by arroyos and protected by chollas, views fan out beyond the unseen international border. Despite the crusty terrain, the ride is smooth and the warm, dry air is surprisingly fresh. By mile four, undulating gardens of distinctive cacti animate the landscape. In the fading light of day, these haunting figurines mimic the human form. Normally, the patriarchal saguaro rules the Sonoran but in this lonely pocket of country features a rival. The banana-shaped organ pipe cactus is not as tall as the saguaro but much wider. While common in Mexico, organ pipe are only found in this US park, which is also a UNESCO biosphere reserve. At nearly 331,000 acres Organ Pipe Cactus NM is the largest national monument in AZ with 95% of the land designated wilderness. Park visitors can explore via two scenic loop drives. The Ajo Mountain drive is the most popular and scenic. It is a 21-mile, one-way loop that traces the base of the mountains before circling back toward the visitor center. Across the highway is the Puerto Blanco Loop, a 37-mile drive through mostly open desert and gaping views. Other rough 4WD roads are options for longer stays and seasoned visitors. The park has several official hiking trails but the premier trek is summiting 4808-foot Mount Ajo, the areas highest peak. This is a full-day hike, partially off-trail totaling 9 miles with a cumulative elevation gain of 2800 feet. Definitely not for beginners. A shorter and easier option is hiking the trail from the campground to the visitor center. Enjoy pleasant views of the mountains while traversing through copious cholla gardens. There are a few benches along the way. The exceptional Twin Peaks Campground, featuring 360-degree views, was fully remodeled less than ten years ago. There is reliable vacancy nearly year round. If interested in hotels, find a few in the town of Ajo about 35 miles away. Summers at Organ Pipe Cactus NM are hot. The ideal times to visit are between November and early April with pleasant daytime highs and cool nights. Delicate ground flowers such as poppies and owl clover flourish in late February and early March. The strength of annual blooms vary and flowers wither when daytime highs exceed 85 degrees. Saguaros and organ pipe cacti don’t bloom until May. Dining choices are also limited. There is a convenience store and small diner in Lukeville, a military-border town about seven miles away. Purchase a few snacks and cold water at the visitor center, otherwise, it’s a lengthy drive to a restaurant. If you are interested in seeing the best of Organ Pipe Cactus NM consider joining me on a group workshop. Due to high springtime demand of my private tours, I’m assembling a 3-day group event in March of 2018. If interested, message me for more information. In addition to hiking, my book also includes a photography section for each lake. This provides useful information for both the serious shooter and the casual looking to improve his or her (smartphone) shots. While each chapter is unique, topics include instructional, technical and creative advice. Also discussed are nearby points of interest, strategies for finding the best composition and more. You might learn something that isn’t obvious too. For instance, notice the distance from the water in the picture below. It’s about a half mile and 500 feet of elevation away. In many spacious basins, it is challenging to explore everywhere in one visit. That’s why tips on where to go help. Below is partial excerpt for a popular location in the San Juan Mountains. July and August are the perfect times to visit. For an amazing experience, consider personal instruction and guidance by yours truly this year! Find more information about this here. Capturing or witnessing Upper Ice Lake Basin’s signature alpenglow is an exclusive experience available to those willing to spend the night. Golden Horn is the most iconic peak and befittingly shows off the best display of crimson morning light, both before and immediately after sunrise. 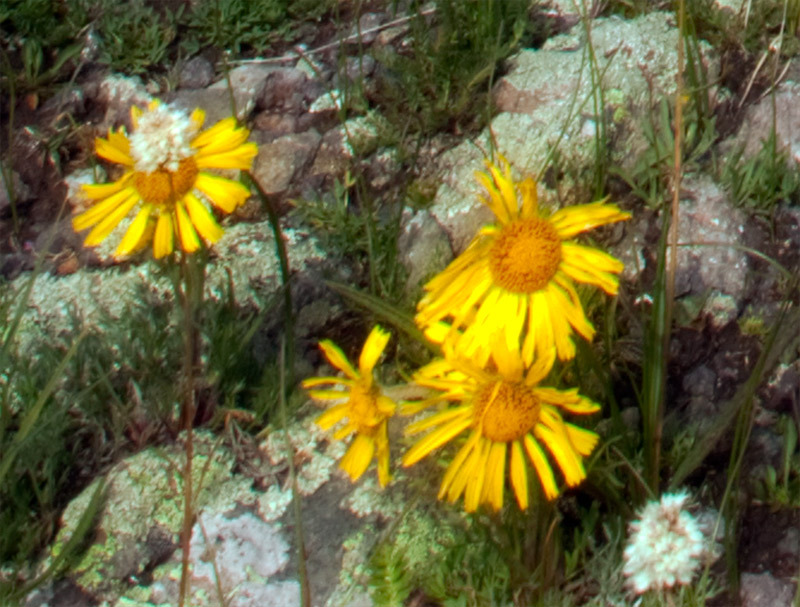 During times of peak wildflowers, compositions are plentiful. The most iconic shots feature alpenglow reflections and successful ones accentuate form. Consider shooting at an intimate tarn as opposed to Upper Ice Lake. Sunrise images won’t display the lake’s vivid color, which needs direct midmorning light. Be sure to bracket shots or use a graduated neutral-density filter. Another alternative is shooting Ice Lake’s hefty outlet stream. Several sections of rippling cascades offer excellent vantage points. These dynamic compositions usually do not include the lake. Use a wide-angle lens and try blending for depth of field. Perhaps skip the water altogether and fill your foreground with a bouquet of splashy wildflowers. This works best on still mornings and emphasizes spectacle. Whatever you choose, the best plan is staying more than one night to ensure the greatest opportunity for success. Sunrise is not the only time for mesmerizing photography. Midmornings on partly cloudy days also yield outstanding results. Remember to use a polarizer and shoot when the groundcover is in partial shadow. Even in harsh midday light, the lake photographs well with a smartphone. Below is an excerpt from my new book, Capturing Colorado: Hiking & Photographing Lakes of the San Juan Mountains. Celebrate summer with a definitive guide to Colorado’s finest range. Find out more about this exciting guide here. Clouds play hide-and-seek amid unearthly red peaks and motley fields of flowers en route to Hope Lake. The price to pay for this special occasion is a paltry one – 2.5 miles and 1500 feet of altitude gain. A relative drop in the bucket compared with the taxing work necessary to reach other locations with similar scenery. Hiking is part of the allure, making this adventure an ideal choice when exploring near Rico and Telluride. Begin on level dirt venturing through a shaded forest before reaching a hillside gulley. The streambed is wide and shallow but floods after heavy rains. An unobstructed presentation of a looming crest soon appears. Accentuated by the chattering sounds of water, these stately sights impress. Effortless hiking continues for over a mile, including a brief downhill stint on a series of meandering switchbacks. Views progressively improve with shimmering Trout Lake and the unorthodox skyline of the Lizard Head Wilderness afar. Twenty-five minutes of walking brings the confluence of two major waterfalls and the trail traces them upwards. A wooden sign marks the beginning of this climb, which is a natural resting spot. Nearby, a tree-covered ravine makes an enchanting place to investigate. The final push takes place on moderate switchbacks through a timber canopy and open understory. An occasional window offers compelling views of an imposing peak. Walk on soft ground while enjoying the roaring sounds of water splashing down the mountain. OK that’s pretty technical. Without getting too convoluted, I define chromatic aberration as color fringing that usually occurs around objects as magenta, blue, red or green outlines or highlights. Chromatic aberration basically occurs from a combination of light, subject matter, aperture selection, and lens quality. It is mostly noticeable in the background of images along horizons and is especially noticeable in mountain scenes captured during the daytime where minor patches of snow are evident. In some photographs, a small amount of chromatic aberration is acceptable and is usually an easy fix in Adobe Camera Raw or in Photoshop with just the click of a button or the movement of a slider. Where fixing this problem gets tricky is if there is quite a bit of chromatic aberration that appears in different colors or if you are a perfectionist like I am. Before we get ahead of ourselves let’s quickly discuss how Photoshop or ACR fixes this problem. From how I understand it, what the software actually does is it picks up your image and moves it slightly so that it covers the areas of fringing. However, this isn’t a local selection – it is actually a ubiquitously occurring process in that it moves the entire picture so all areas of your image are affected. The problem with this is that it affects the overall image quality because there is a minor loss of resolution every time this movement is performed. Secondly, the image shift depends on the color so fixing a magenta color fringe won’t necessarily rectify a red one and vice versa. In that particular case, using the software results in a compromise where the color fringing effects can be offset and reduced, but not completely fixed. Let’s look at an example at how I circumvented both of these issues. Do you notice the bluish-green fringing around the flowers in the before image below? What you are looking at is a small portion of an image that was commissioned by a local bank in Colorado to use for the front of their 2013 calendar. Because the image was being used at approximately 8.5 x 11 for mass distribution I wanted to make it look as good as possible. This was a small fix and it can be a little time consuming. However, if delivering the highest quality product to your clients is must for you (like it is for me) then it is worth the time. I find the easiest way to fix this problem is with the color replacement tool in Photoshop. In this case, I simply use the color of the flower petals or a neutral grey and trace away the noticeable effects of the chromatic aberration with the color replacement tool. The most important aspect of this method unlike other quick fixes is that it does not sacrifice image quality or resolution. Conversely, it actually makes your image higher quality! I hope you found this post helpful I’d love to read your comments or questions regarding it! My goal is to follow up this post with another blog about Photoshop techniques in the near future.